TOFAS, pure Mediterranean goodness. Enjoy fresh, authentic, flavorful, wholesome food that is cooked and seasoned to perfection and always served with a smile. DOWLOAD the TOFAS Rewards & Loyalty App! 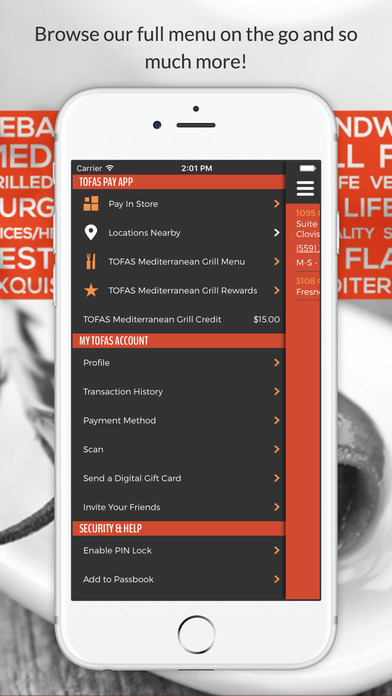 The TOFAS app is a fast, convenient way to put Pure Mediterranean Goodness at your fingertips, besides, we sweeten the deal with our Rewards & Loyalty Program. Available on your Apple, Android, or Google Device! 3108 E. Campus Pointe Dr.